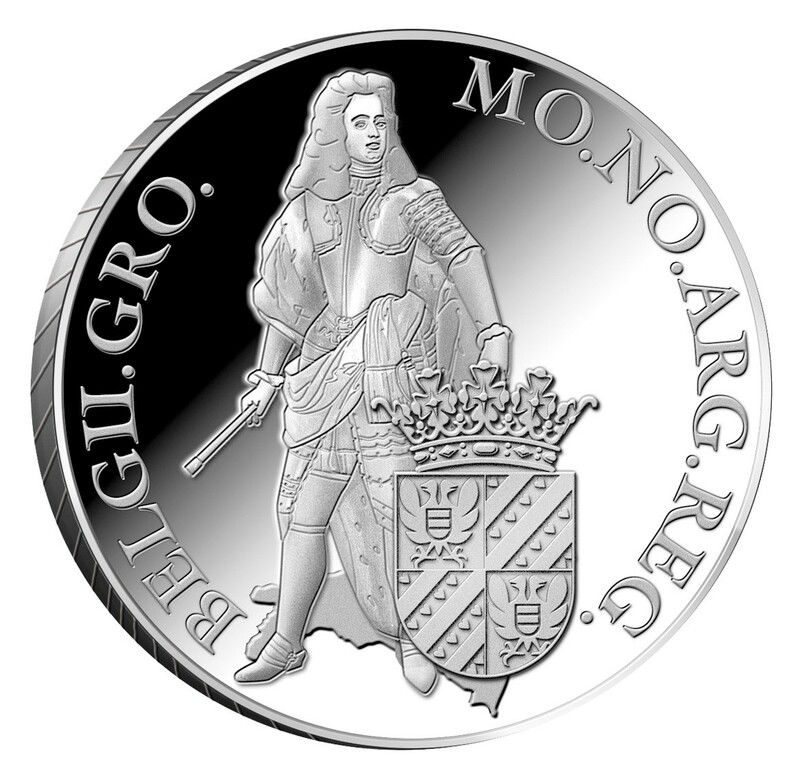 The Royal Dutch Mint has released (6th December) the latest silver ducat which is part of their current series, with this coin featuring the historical province of Groningen. The silver ducat was once a very important means of payment for international Dutch trade between 1659 and 1816. The silver ducat was used on a literally inhabited continent as a means of payment not only for Dutch merchants but for other economies and became a trusted and sought-after means of payment for trade. Today, although the silver ducat is no longer used the same way as it was two hundred years ago, the ducat is still included in the Dutch Mint Act and is considered a legal tender monetary instrument. 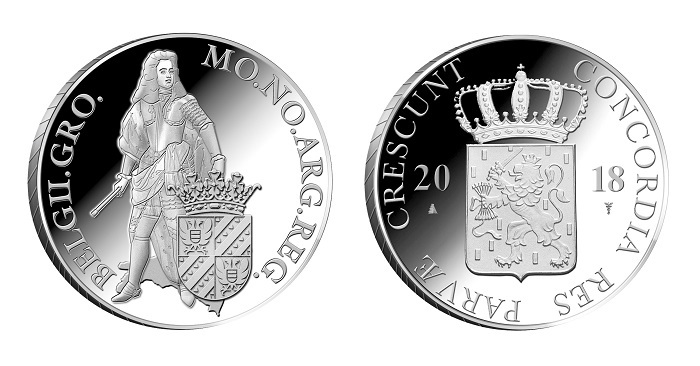 Every Dutch province has its own ducat with an “armoured anonymous Knight,” or, someone who was crucial for that province or the cultivation of the Low Countries. This 2018-dated silver ducat is the 11th issue in the current series “The Twelve Provinces,” which sees a change in the design each time a series ends and another begins. The historic province of Groningen is featured, which is the largest city in the north of the Netherlands. An old city, Groningen was once the regional power of the northern Netherlands as well as a semi-independent city-state and member of the German Hanseatic League. The oldest document referring to Groningen’s existence dates from 1040 A.D. but the first major settlement in Groningen has been traced back to the third century A.D. By the 13th century, Groningen became an important trade centre, so as a measure to protect its citizens and wealth, its inhabitants built a city wall to also underline its authority. The bustling city had a strong influence on the surrounding lands that its own dialect became a common mode of speech. Groningen’s most influential period was towards the end of the 15th century when the nearby province of Friesland was administered from Groningen. During these years, the Martinitoren, the region’s highest church steeple as well as the bell tower of the Martinikerk Church, was built and towered over the city at 127 metres (417 feet) tall. Unfortunately, Groningen’s independence came to an end when in 1536 it chose to accept Emperor Charles V, the Habsburg ruler of the Spanish Netherlands, as its overlord. Soon after, in 1594, Groningen was itself conquered from the Spanish by a Dutch and English force led by Maurice of Nassau, Prince of Orange (1567-1625) after which, the city and the province joined the Republic of the Seven United Provinces. Groningen became a greater centre for learning when in 1614, the University of Groningen was founded, initially only for religious education. In the same period, the city again expanded rapidly and a new city wall was built, for a vital defence. That same city wall would be tested during the Third Anglo-Dutch War in 1672 when the city was severely attacked by the bishop of Münster, Bernhard von Galen (1606–1678). The city walls repelled the attack successfully and it this event that is still celebrated with music and fireworks on every 28th August and is referred to as “Gronings Ontzet,” or “Bommen Berend”. The Netherlands managed to remain neutral during the First World War but the country, and, in particular, the city of Groningen, did not escape the devastation of World War II. Groningen’s main square, the Grote Markt, was largely destroyed in April 1945, which is remembered as the Battle of Groningen. Fortunately, the Martinitoren and its adjacent church, the Goudkantoor, the historic building which served to hallmark gold and silver and the city hall, were not damaged despite the battle lasting several days. Today, the population of Groningen is just over 360,000 persons, however, as the city is well-known for its two primary universities, the student population is just over 55,000, with the majority attending the University of Groningen and the Hanze University of Applied Sciences. Groningen’s economy is mostly dependent on services rather than agriculture or heavy manufacturing, though there is one important sugar factory in the town of Hoogkerk which produces 235,000 tonnes of beet sugar and employs 283 persons. Johan Friso remained Stadtholder of both Friesland and Groningen even after the five provinces of the United Netherlands, which King William III of England ruled over and suspended the office of Stadtholder after his death. Johan Friso is remembered for establishing the third House of Orange, which would become extinct in the male line in 1890. It is, however, noteworthy to mention that the royal descendants of John William Friso, Prince of Orange, currently occupy all the hereditary European royal thrones with Johan Friso and his wife, the Landgravine Marie Louise of Hesse-Kassel, being the most recent common ancestors of all the European monarchs. 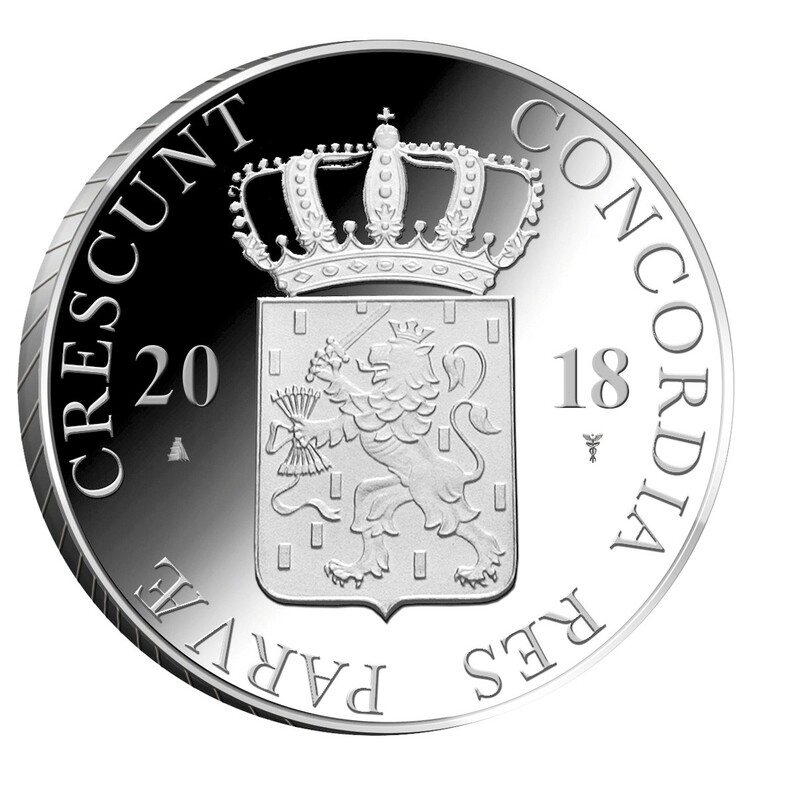 The reverse of the coin includes the modern crest of the Kingdom of the Netherlands, crowned, along with the year of issue seen as two digits on either side of the shield. The Latin text around the crest reads CONCORDIA RES PARAVE CRESCUNT (“In harmony small things grow”). This traditional trade currency coin has been included in the Dutch Mint Act for over 350 years, and, as such, they are one of the oldest continued coins minted in the world. The coins will be available at the end of December and each is encapsulated and presented in a custom case along with a certificate of authenticity. For more information about this coin and others available from the Royal Dutch Mint, please visit their website.